It's Time to Energize Your Music. 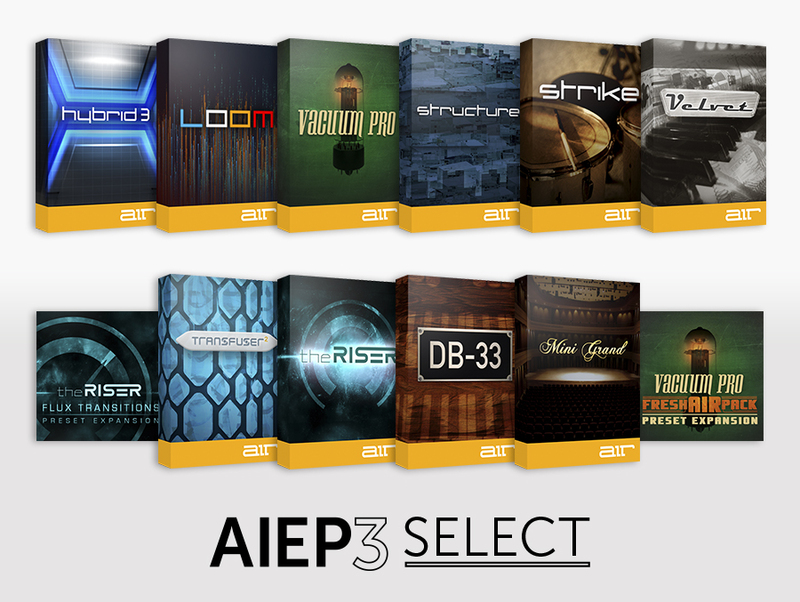 The AIR AIEP3 Select Instrument Pack is an inspiring collection of twelve virtual instruments and progressive sound-design tools for the modern producer, composer and performer. Developed by AIR Music Technology, the team responsible for creating the award-winning virtual instruments and core effects offered with Avid's Pro Tools software, the AIR Instrument Expansion Pack brings the world's most innovative virtual instruments to your favorite DAW. These twelve instruments, ranging from breathtaking emulations of vintage gear, classic instruments and unique synthesis technologies, enable you to tap into familiar sounds or create something no one has ever heard before. With the AIEP3 Select collection there's nothing you can't do. Energize your music. "An incredible collection of sophisticated instruments." - Synthtopia.com. Hybrid 3.0 – High-Definition Analog & Wavetable Synth. Loom – Modular Additive Synthesizer. Vacuum Pro – Polyphonic Analog Tube Synthesizer. Structure – Multi-Timbral Sampler Instrument. Strike – Ultimate Virtual Drummer Instrument. Velvet – Vintage Electric Piano Instrument. Transfuser 2 – Melodic & Rhythmic Groove-Creation Instrument. THE RISER – Synth-based Transition Designer. DB-33 – Tonewheel Organ Simulator. MINI GRAND – Acoustic Grand Piano. Fresh AIR Expansion – Presets for Vacuum Pro. Flux Transitions Expansion – Presets for theRiser. The Premier Virtual Instrument Collection. The AIR AIEP3 Select Instrument Pack combines multiple synthesis technologies, premium instrument samples, high-definition drums, vintage electric pianos, and a comprehensive groove-creation platform to provides today's musician, composer, and producer with the latest innovations of German-engineered software. Hybrid 3.0 is an analog and wavetable synthesizer that combines the warmth of analog synthesis with futuristic digital controls; Loom is a modular additive synthesizer that lets you explore additive synthesis with 30 editable modules and a sound-shifting Morph Pad; Vacuum Pro is a polyphonic analog tube synthesizer that re-invents the gritty glory of the analog age; Structure delivers a world of sounds with multi-timbral layering and comprehensive sample editing; Strike is a drum and arranger instrument with a realistic performance engine; Velvet puts five sought-after electric pianos at your fingertips; and Transfuser 2 is a melodic and groove creation that offers powerful sound manipulation capabilities. Altogether, the AIR instrument Expansion Pack includes 70+GB (uncompressed) samples, loops, effects, and 2500+ tweakable patches and presets programmed by legendary sound designers. All twelve plugin instruments in the AIR AIEP3 Select Instrument Pack are available in VST, AU, and AAX formats. Each title seamlessly integrates with popular DAWs such as Ableton Live, Logic, Cubase, Pro Tools, and more. The new AIR Instrument Expansion Pack includes the 2.0.2 enhancements of its 4 core offerings (Strike, Velvet, Structure, and Transfuser 2), 1.0.1 versions of Loom and Vacuum Pro, and AIR Music Tech's flagship synthesizer – Hybrid 3.0.